March was a very interesting month across middle Tennessee. Here in Cookeville, We saw March come in like a lamb with quiet, above normal temperatures during the first 5 days or so. 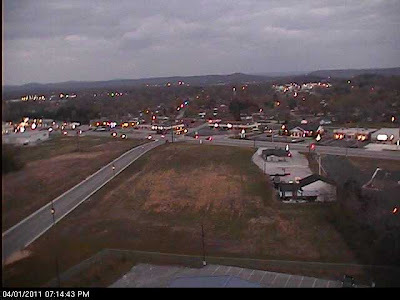 The photo above is from one of two webcams maintained by the Cookeville/Putnam County Emergency Management Agency. See their weather site or you can view their Facebook page. From the 17th to the 22nd, we saw temperatures top 70° for 3 days and top 80° for another 3 with nearly a week of 70°+ readings. Those warm readings were followed by a cold spell from the 25th-31st with just one day above 60° (the 29th). The warmest day of March was 22nd at 81° while March 2nd was the coldest low at 30.8°. March 2011 had just one day with highs in the 30's and that was on March 6th. We had just 6 days with highs in the 40's and 5 of those 6 occurred in the last 7 days of March! Precipitation was quite the story as well. We finished up with 7.06" (much above the average of 5.63" during a typical March). We saw snow mixing in with rain yesterday (3/31/2011). Just as we think we're into spring, we are reminded of how much variety Tennessee really has! There was measurable precipitation on 14 of 31 days. The most in a 24-hour period (measured from midnight to 11:59 pm) was 1.85" on March 30th with 1.50" measured on March 5th and 0.98" measured on March 9th. For the year, we sit at 17.38 of precipitation, which is above the norm of 15.44" for the first three months of the year. The highest wind gust was 44 mph on March 9th with gusts of 30 and 31 mph on March 4th and 5th. During our mid-month warm spell, wind gusts of 20 mph plus were common. If you enjoy numbers, my LIVE WEATHER STATION has a historical file that you can access at Weather Underground. The direct link to my history is here. Want to see other Cookeville-based weather stations? Weather Underground has a page dedicated to Cookeville as well. You can access it here. Be sure when you are there to select Northeast Cookeville as your station near the top of the page. My station updates automatically every 2 seconds.